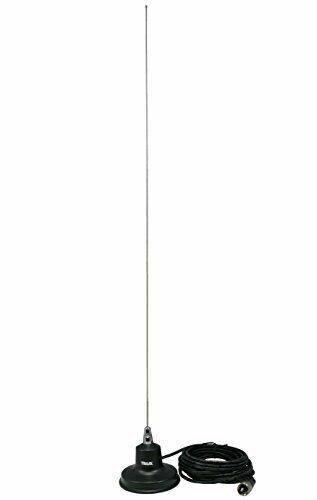 Omnidirectional Antenna VHF 140-175 MHz, tunable (cutting chart included), 5/8 wave, 3 dBd. 3 1/2" black magnet mount. It is amazing how much range this antenna will add to a 5 watt handheld vhf radio (pofung UV-82) I stuck it on top of my grill on the deck (deck is 6 feet off the ground) and my wife was able to clearly communicate with me from my truck (45 watt mobile) at a google verified 9 miles over fairly level ground through thick woods and swamp. That is about three times the distance we could reach with the standard antenna. The antenna has a chart that tells you what length to cut the whip to give the best performance for a given frequency. You cut it. It's held in place with a set screw and it works. The coax is a good length for a magnetic based antenna. Very good quality and an excellent product. the antenna looks good and works great!